Chain drives are a very important invention for any mechanical device, especially any device that needs to be able to change speeds while in motion, such as the bike above. The chain in the system connects two gears, and the ratio between the speeds at which two connected gears turn is the same as if the gears were connected directly, even if they are some distance away. This system corrected many of the problems of the belt drive system (developed several centuries previous to this system but also by the Chinese), such as belts slipping off of the cogs that they were on. 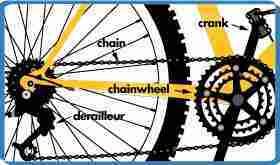 The chain drive system, and even the belt drive system, are in widespread use today, in things ranging from bikes, as shown above, to cars, where the timing belt (sometimes replaced with a chain to prevent it from breaking) connects many of the driving systems of the engine. Was used to improve on the designs of many existing machines, primarily textile machines that had used belts previously. Was a major component in many of the machines that were essential to the early Industrial Revolution; is still used today in many machines, especially those used for transportation.